This online Moving and Handling training explains the process of moving someone safely and gives step-by-step guidance, showing the most common lifts and moves. This training is ideal for those working in the care sector, where moving and handling people are regular occurrences. 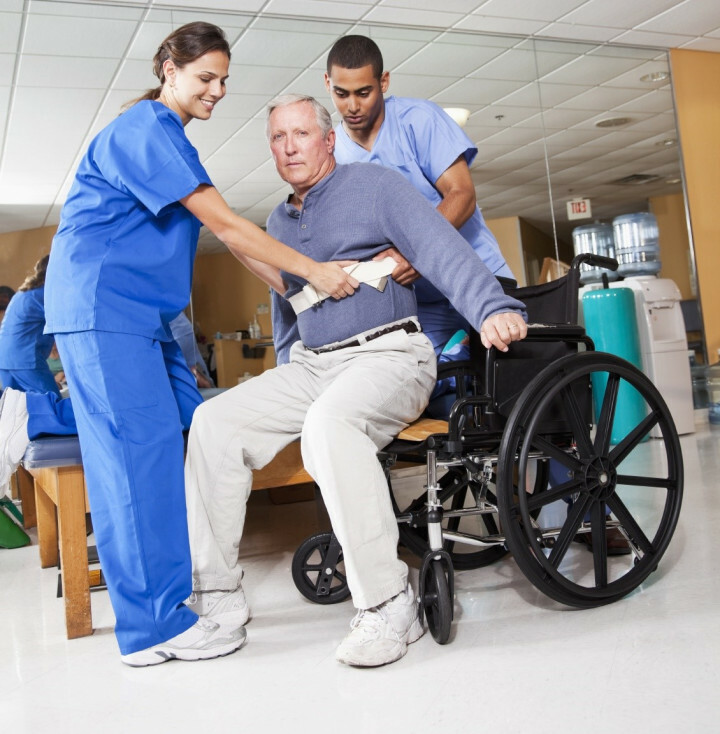 This Moving and Handling People course is designed to help you identify and understand the risks of moving patients or elderly residents, as well as teaching you the best ways to move people safely. Poor moving and handling technique accounts for around 7000 injuries reported within the health services and social care each year, so having the correct training is critical to ensure nurses, carers and staff exercise best practice and carry out their work safely. This programme will help you to recognise where lifting and moving could be hazardous and shows you the correct steps to lift and move safely. It looks at the person you are helping and what you can do to make sure you've thought of everything before you lift or move them. This kind of health and safety training for moving people ultimately aims to reduce the chance of injury when moving people in your care. Understand your responsibilities and avoid causing unnecessary injuries with our Moving and Handling People Training - Get instant access today. Not quite what you were looking for? Did you mean Manual Handling Training? The Moving and Handling People Training course is broken down into 3 sections. In this section we look at how your back works and how easy it is to damage it. We look at good posture and balance and explain how slipped discs and back pain are caused. Knowing how intricate and perfectly designed your back is and exactly how the damage from poor posture and poor lifting technique builds up over time, will help you to undertand how simple adjustments NOW will help avoid problems in years to come. Before lifting or moving someone you need to plan ahead. Think about the person, think about yourself, think about what's going on around you. It's the same for any task where you are moving anything, but lifting and moving a person is more complex and requires more thought and consideration. In this section we're looking at what there is to help you, from individual care plans, risk assessments, and specialist equipment through to planning ahead and clear communication. This section uses step-by-step guidance to explain how to perform twenty of the most common lifts and moves, such as helping someone to stand from sitting, helping someone who has fallen, rolling someone in bed and helping someone move from a bed to a wheelchair. Clear instruction shows you how to maintain good posture during the lifts and moves. The section includes moves and lifts using slidesheets, transfer boards and turntables, slings and hoists and covers the pre-use checks that should be done when using slings and hoists. This Moving and Handling Training course concludes with a 20 question multiple choice test with a printable certificate. In addition, brief in-course questionnaires guide the user through the sections of the training and are designed to reinforce learning and ensure maximum user engagement throughout. Your Moving and Handling Certificate includes your name, company name (if applicable), name of course taken, pass percentage, date of completion, expiry date and stamps of approval or accreditations by recognised authorities. Based on 69 real user reviews. the slides show are visually good. The slides and instructions for the maneuvers are very clear and easy to follow. Staff really helpful thank you ???? Read our full reviews for Moving and Handling People Training. What are The Manual Handling Operations Regulations 1992? The Manual Handling Operations Regulations 1992 define manual handling as, "any transporting or supporting of a load (including the lifting, putting down, pushing, pulling, carrying or moving thereof) by hand or bodily force"; with "load" including any person and any animal. Placeholder image for Why is Manual Handling Training Essential for Anyone and Everyone? Why is Manual Handling Training Essential for Anyone and Everyone?